Date of light or finger of light or Deglet Nour is a cultivar of date which is commonly referred to as the "queen of all dates". It is so called because of their slight translucency, elongated shape and their seed can be seen right through the flesh when exposed to the light. Its soft touch, a translucent light color, a soft honey taste and mouth melting distinguish it from other dates. Several old books provide evidence that the Deglet Nour date was first grown in Algeria because it is a country that possesses the ideal natural environment for the growth of date palms, where fresh air arrives from the Mediterranean Sea and the Atlas Mountains. No other country can provide such an optimum combination of temperature, humidity, soil properties and ground waters close to the surface, which allow the cultivation of these exotic trees in plantations giving record harvests of perfect quality, as Algeria. In the Algerian desert where the food and source of water are so scarce, the nomadic tribes call the dates “bread of the desert”; it is always served with tea. They refer to the palm tree as the tree of life; it grows between 15 to 20 meters high and bear fruit for up to a century. Every two years the palms’ pollinated flowers bear new dates. According to them from the palm tree they were able to produce many products. This cultivar of date is mainly grown predominantly in Biskra province of Algeria (in the oases of Tolga and Oued Righ). Despite being grown in several Mediterranean countries, Algeria remains the chief export and the world's largest producer of Deglet Nour. The fruits dry in the simmering heat of the desert sun while still on the branch without any treatment or chemical addition. As soon as the drying phase is over, the ripped dates are harvested by hand. After that, they are first sorted by size, degree of drying and further criteria before they are washed and sprinkled with drinking water until the desired moisture content has been reached. 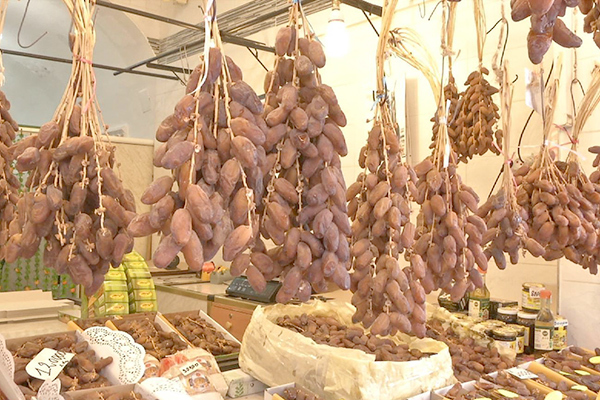 Deglet Nour dates are praised all over the world for their high nutritional value .They are fully loaded with many vitamins and minerals ,rich in potassium, iron and fluorine. They also contain sulfur, magnesium, phosphorous, calcium, manganese, copper, amino acids, vitamin A, B, specially B6, C, K. Due to their high nutrient concentration, dates were counted as a staple foodstuff as far back as 5000 years ago, and this is also the case today. When looking at their rich level of nutrients, it is not surprising that dates have enjoyed such a significant role in various stages of history. The date “Deglet Nour” with its vitamins and mineral nutrients, it is a highly effective combined energy source. Not only can the sweet honey caramel date fruit pulp be used as an important food product and energy source, but in the desert the date pits are also trampled down, mixed with a small amount of water and used as animal food. The dates can be kept fresh and elegant even out of the refrigerator. Dates are characterized not only by their high number of vitamins and trace elements, but also by their significance in human history. Dates also enjoy an important role in Islam. During the fasting period of Ramadan, Muslims break their fast after sunset with a date and a glass of water or milk, as the Prophet Muhammad (peace and blessings be upon him) purportedly recommended. Today, Deglet Nour is one of the leading products of Algerian agriculture. Its sweet, delicate taste and pleasant texture made Deglet Nour the most popular among all date’s varieties.